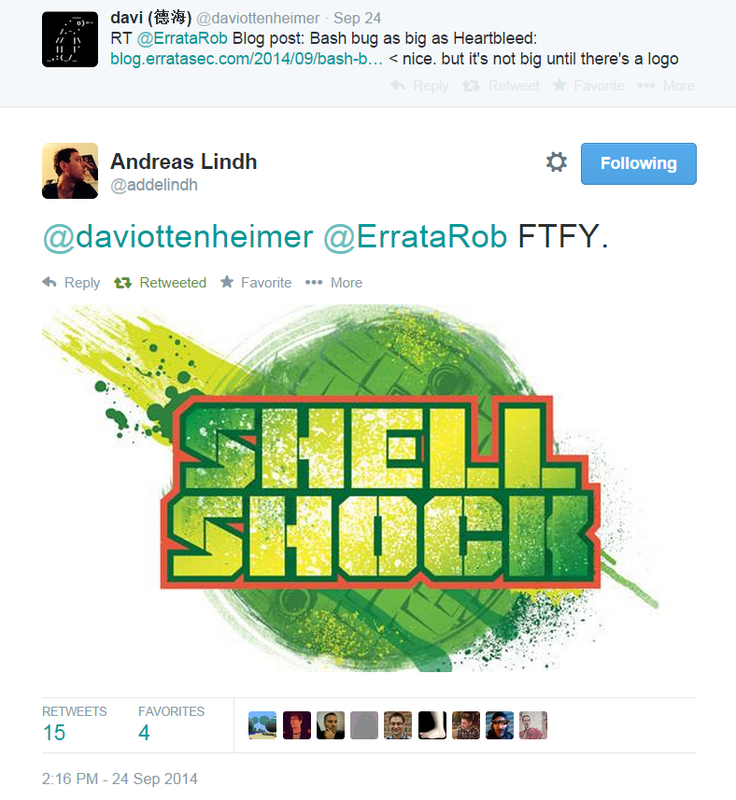 Errata Security: Who named "shellshock"? 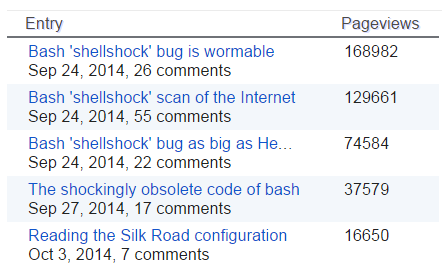 Because it's terribly important to cybersec, many are debating the origin of the name "shellshock". I thought I'd write up the definitive answer. The answer is that it came from this tweet by Andreas Lindh. That's the absolute origin of the term. Andreas made it up himself. Also, to some extent Davi Ottenheimer deserves some credit for starting the conversation among a bunch of people with his tweet saying "it's not big until there's a logo". Lots of people posted logos as that point. Also to some extent I deserve some credit for then pimping the "shellshock" name in my blogposts, which received a lot of attention in the early hours of the shellshock crisis. As you can see from the pageview stats below, these posts got a lot of attention. Also, most of the early news stories on "real" news websites referenced me and my posts. Those news sites got the name from me, and I got it from Andreas and nobody else. I suspect what really helped it along is that when I scanned the Internet for the bug, putting it in everybody's webserver logs. I included a pointer to the "shellshock scan" post in the user-agent string. That pretty much made it official for every geek looking at logs, regardless of what name news stories might choose. The reality is that nobody knows how these things happen. A lot of us were online on twitter discussing the bug, the technical details, and goofball things like what its logo should be. It's a product of mass consciousness and insanity rather than any one person. But if you had to pick somebody to blame, it's Andreas Lindh.